Kevin Harvick started second, finished first, scoring 10 bonus points and a playoff point. The Busch Outdoors driver raced to the lead on lap 15. The No. 4 Ford surrendered the lead to come to pit road under green-flag conditions on lap 75 for four tires and fuel. Harvick reclaimed the lead on lap 81 and held it for the remainder of the stage. The team came to pit road for four tires and fuel at the end of the stage. Started second, finished first, scoring 10 bonus points and a playoff point. Harvick claimed the lead on the restart to begin Stage 2. The Busch Outdoors came to pit road under green-flag conditions from the lead on lap 189 for four tires and fuel. Harvick reclaimed the lead on lap 195 and held it for the remainder of the stage. The team came to pit road at the conclusion of Stage 2 for four tires, fuel and an air pressure adjustment. Started first and finished sixth. Harvick surrendered the lead to come to pit road under green-flag conditions on lap 320 for four tires and fuel. He reported a flat left-rear tire as a result of a broken valve stem and had to return to pit road on lap 322, causing him to fall a lap down to the leaders. The team earned the free pass as a result of a debris caution on lap 340 and restarted 13thafter returning to the lead lap on lap 344. Harvick raced his way back into the top-five by lap 389. The Busch Outdoors Ford came to pit road under caution on lap 393 for two tires and fuel. Harvick restarted 11thon lap 396 and narrowly avoided a wreck on the restart to advance to the eighth position. Harvick raced the No. 4 Busch Outdoors Ford from eighth up to sixth during the overtime. 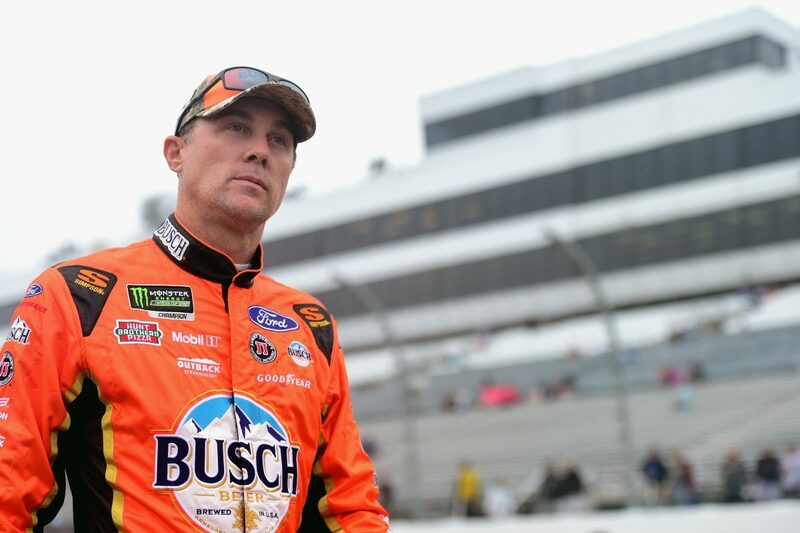 This was Harvick’s series-leading 25thtop-10 of 2018 and his 17thtop-10 in 36 career Monster Energy NASCAR Cup Series starts at Dover. Harvick finished first in Stage 1 to earn 10 bonus points and one playoff point, and first in Stage 2 to earn an additional 10 bonus points and one more playoff point. Harvick led five times for a race-high 286 laps to increase his laps-led total at Dover to 1,442. Chase Elliott won the Gander Outdoors 400to score his second career Monster Energy NASCAR Cup Series victory, his second of the season and his first at Dover. His margin of victory over second-place Denny Hamlin was .265 of a second. The next event on the Monster Energy NASCAR Cup Series schedule is the 1000Bulbs.com 500 on Sunday, Oct. 14 at Talladega (Ala.) Superspeedway. It is the fifth race of the 10-race playoffs and the second race in the Round of 12. It starts at 2 p.m. EDT with live coverage on NBC. Prerace coverage on NBCSN begins at noon with NASCAR America followed by Countdown to Green at 1 p.m.